Every one of YOU...it's that simple. YOU make our work possible. All of the Good Intentions in the world cannot be realized without the financial back-up. So forget about great deals on Black Friday - give the gift of LOVE and pass it on to everyone you LOVE and in honor of those you LOVE - let the LOVE shine through on this holiday weekend...and always! LARC now has it's own 501(C)3 tax-exempt status as a nonprofit charity through the IRS! All of us at LARC, Serenity Park and NEWARC have much to be thankful for....from tushie rubs and furry tails, to nightly yips and moonlit howls. The above picture is of Leeloo who was rescued from an Orange County Shelter several months ago and is alive today due to LARC's efforts and a cadre of supporters who refused to let her be put to sleep - here she with gratitude in her eyes on her second day of renewed life at LARC. "The Spirit of Gratitude itself is not only an expression of deep appreciation that blesses the intended recipient but it is also a spiritual state of grace or peaceful well-being that blesses the individuals who carry it within their own hearts and minds. If we take a moment to stop and count our blessings all of us have so much to feel grateful for (especially that which all of us have collectively as a community provided for and shared with one another throughout the course of each year )...Wishing all of you the happiest of Thanksgivings this year in whatever manner you choose to observe it." As we celebrate our Giving Thanks Day, LARC is also preparing to send our WolfGuard Team into the wilderness of Montana and Idaho to protect the wild wolf. Just as the Team did last year, we are hoping to see a dramatic decrease in the number of wolf lives taken as we monitor the hunters and the traps laid for the wolves - nearly 100% being illegal either in size or placement. LARC is still gearing up for a very large rescue and was in the Midwest earlier this month. Because there is a lawsuit involved we are at the whim of the criminal justice system and the courts...it is our sincere hope we can rescue the wolves we know are in danger - and our dear supporters will be the first to know if that comes to fruition! In the meantime, and with Paws crossed, LARC has been building new enclosures and has arranged for all of the veterinary care these animals will require. LARC was also in Washington State in September trying to offer a resolution to the death sentence handed down to the Profanity Peak wolf pack in Ferry County, just south of Canada, because they depredated on cattle. We offered to take the remaining wolf pups and adults to our sanctuary - not that sanctuary life is ever a good substitute for the wild - but it is a reasonable substitute for death. During the winter, the cattle are not grazing on public lands - the true reason for this tragedy in the first place - so the wolves are not a threat and thus are not being hunted and trapped. We may be revisiting this issue come Spring, however - so sad! Please stay tuned. We say it every year - but NEWARC is getting ready for winter. That is no easy feat in the White Mountains of New England. Many, many cords of fire wood have been cut and stacked - so bring on the cold! The wolves love it! And NEWARC also has it's own 501(C)3 tax-exempt status as a nonprofit charity - so you can give directly to the wolves and veterans in the Northeast! Sponsor a NEWARC Wolf or Veteran! Notable Documentary Director Robby Kenner and Melissa Robledo of "Food, Inc" and "Merchants of Doubt" fame are nearing completion of their documentary on the parrots and veterans of Serenity Park! We will let you know the release date - hopefully by the end of 2017! We are hoping that this will bring worthwhile attention to parrots in captivity as well as the lack of employment for our returning Veterans. We are again providing the link to the online version of the New York Times Magazine article - click on the pair of parrots below. Ah, we might as well provide the link again for the segment done on Serenity Park by the CBS Morning News with Jane Couric, which if you haven't seen it already, is well worth the time. 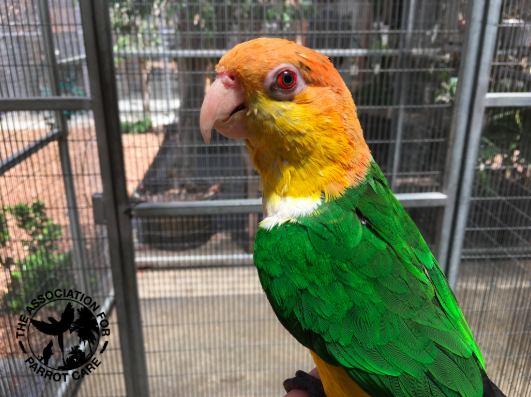 Many of the Veterans who work at Serenity Park Sanctuary are in a quandary around the Thanksgiving holiday - everyday they help the parrots at the sanctuary, rubbing their little breastbones and playing with their little legs. So they have a hard time reconciling going home and cooking a turkey. We deeply understand this and help out by preparing Tofurkeys and lots of delicious non-bird based foods as a healthy and more humane alternative to the traditional fare. Below is Corey, lying on his back due to injuries he suffered in combat, with our newest arrival - Indigo (aka Indy). Thanks to Indy's forward-thinking "Mom" who knew this would be a place where Indy could thrive...and get petted all day long :)) And, of course, that is just the therapy Corey needs, too! Indy's huge flight aviary, as well as several other aviaries, was completed with the help of Laura Bryna and her friends and family...and we thank them each and every one of them - with tremendous gratitude! Over 6,000 Veterans and their families are Celebrated on Veterans Day! On November 11, 2016 scores of volunteers (I wish I could thank them all :) helped feed thousands of veterans! With the support of a grant from Metabolic Studio, Serenity Park was able to pull off a most amazing event right at the parrot sanctuary. 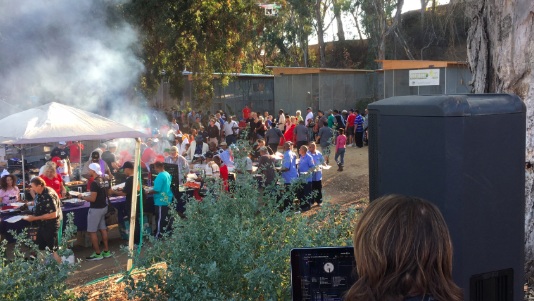 Operation Gratitude provided thousands of boxes of sweatshirts, tee shirts and toiletries and everyone went away with their hands...and bellies...full! While we struggled with what we were going to do with the many veterans in wheelchairs we received a phone call from out of the blue. A woman in New York said she would pay for a sidewalk to be installed - could this be true?? Yes!! But how to get it done in the week before Veterans' Day - why, call Baltazar Construction of course (the same company who did the 405 freeway!! - if you know Matthew you are not surprised he made that call :))). Mr. Baltazar himself came and helped install the sidewalk - and at an extraordinarily reduced rate. We are so grateful to you all!! And thank you to the Greater Los Angeles VA Medical Center and all the veterans working and staying there - leftover sweatshirts and toiletries were brought to every building on that campus for the veterans there... thank you for your service. PLEASE DO CLICK ON THE DONATE BUTTON ABOVE AND SEND YOUR SUPPORT - SAVE YOURSELF THE HEADACHE OF SHOPPING ON BLACK FRIDAY AND FOR THE CHRISTMAS HOLIDAYS!! GIVING THE GIFT OF A DONATION TO OUR NONPROFIT CHARITIES IS A TAX DEDUCTION FOR YOU AND SOMETHING YOUR LOVED ONES CAN NOT HELP BUT APPRECIATE AND WILL HOPEFULLY PAY IT FORWARD THEMSELVES!